Today is the feast day of Our Lady of Guadalupe. She is celebrated and particularly revered in Mexico and her feast day marks the beginning of the Christmas festivities for many people. Juan Diego, an indigenous peasant, saw a vision of the Virgin Mary in the hills of the valley of Mexico. She told him that a church should be built in that spot in her honor. Juan Diego told the story of the apparation to the incredulous bishop who asked for proof to verify the story. Three days later, Juan Diego returned and the Virgin Mary instructed him to fill his cloak with flowers. Normally, flowers would have been difficult to find since it was winter, but Juan Diego filled his cloak with beautiful blooms. When Juan Diego opened his cloak before the bishop, miraculously, an image of the Virgin Mary was imprinted on the fabric. This icon is still intact and can be viewed at the Basilica of Guadalupe by millions of pilgrims from around the world. Some pilgrims make their way to the shrine on their knees. I have had the opportunity to visit the Basilica of Guadalupe, located outside of Mexico City, on numerous occasions. It was a very moving spiritual experience. 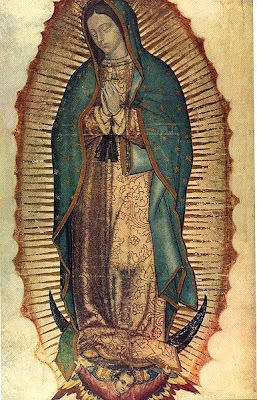 Although people in the United States often begin the Christmas season with Thanksgiving; in Mexico, Christmas celebrations begin with the Feast of Our Lady of Guadalupe and end the Epiphany on January 6. Fascinating story...in grad school I wrote a paper on Our Lady or my South American Colonial History seminar.